In 1990 Iraq was preparing a new issue of banknotes, but plans for this issue were disrupted due to the invasion of Kuwait by Iraq on 2 August 1990, which led to the First Gulf War. The war lasted until February 1991 and, during the war, sanctions against Iraq were imposed by the United Nations, which continued after the war. The sanctions meant Iraq could not import the new currency the Central Bank of Iraq was planning to issue and, as a result, Iraq was forced to issue banknotes which were classed as emergency issues. The Central Bank of Iraq commenced circulating emergency issues of 25 dinars dated 1990, and 50 and 100 dinars dated 1991. Subsequently, many more emergency notes were issued by the Central Bank. The Government of Iraq would like to confirm that there is a dire and pressing need for supplies, equipment and machinery for the printing of the national currency and of banking instruments for the Central Bank of Iraq. It therefore hopes that you will accord the matter your closest attention in view of its intimate connection with the question of improving the humanitarian situation and living conditions of Iraqis, given that the stability and high quality of the currency will have a direct impact on the national economy and will curtail the flow and circulation of counterfeit notes. The request was apparently denied. Of the notes being prepared for issue in 1990, which were not produced because of the imposition of sanctions, were banknotes of 5, 10 and 500 dinars – which are known in various forms, but not as issued notes. This study looks only at the 5- and 10-dinar notes as information on the 500-dinar note is sparse. It is possible other denominations were prepared at the same time, but evidence of this is not apparent. Figure 1 shows the front of the 10-dinar note prepared for the new issue; although this example evidently saw some circulation. Dominating the note at the right is Saddam Hussein, the president of Iraq at the time the notes were prepared. A river scene, probably of the Tigris River, is at the centre (below the text); at centre left is a stand of palm trees; and at the far left is a watermark of the head of a horse. Figure 1 – Saddam Hussein dominates the front of the proof 10-dinar note. This example has seen circulation, despite having no face value. The serial number prefix is ‘آ/١١’ (alif over 11), and the serial number is ‘٤٥٦٧٨٩’ (456789). There is no signature on this proof, which is numbered ‘Proof No. 491/2’. A second proof of this note (not illustrated) carries the signature of Subhi Nadhum Frankool, who later signed all notes of the emergency issues dated 1990 and 1991. The second proof, which is annotated ‘Proof No. 728/2’, has a serial number of ‘ع/٣٩١٠٠٠٠٠٠’ and the dates of ‘١٩٩٠ – ١٤١٠’ (1990 – 1410). De La Rue specimens of this note exist (see Figure 2). Figure 2 – The 10-dinar note as a specimen note, with the signature of Subhi Nadhum Frankool. Figure 3 – The back of the 10-dinar specimen note, showing artefacts from ancient Iraq. At the top left are three stylized trees, which are typically found on Assyrian bas-relief sculptures depicting the open countryside. At the lower left is a plant-like pattern which can be found in relief pavements from the Palace of Ashur-bani-pal at Kuyunjik. At the lower far right is a carved horse’s blinker, decorated with a seated sphinx wearing a uraeus and sun-disk headdress. This blinker (possibly made of ivory) was found at Nimrud and is dated from the eighth century BC. Observed as a De La Rue specimen, the 5-dinar note (see Figure 4) is brown, with the same portrait of Saddam Hussein on the front, as that used in the 10-dinar note. Ancient buildings at Hatra are depicted at the lower centre of the note. Located north-west of Baghdad, Hatra (al Hadr) was a large fortified city under the influence of the Parthian Empire and capital of the first Arab Kingdom. Interestingly, the illustration appears to be a mirror image of the actual scene, where the ruins are viewed, at an unusual angle. At centre left on the front is a statuette of Ur-Nammu (2111 to 2094 BC), King of Ur, an important Sumerian city-state. Figure 4 – The front of the 5-dinar note of the same series; as a De La Rue Specimen note. The back of the note (see Figure 5) has an array of images predominantly from antiquity. At the centre is a house built by the marsh Arabs, or the Ma’dan, in southern Iraq. Built entirely of reeds, the ‘mudhif’, as the structures are known, were built in the marshes from reeds harvested in the marshes. These types of buildings are believed to have been built for many centuries. Below the image of the mudhif, running just above the text ‘FIVE DINARS’, is a frieze from the Sumero-Akkadian period, which was located in the Iraq Museum in Baghdad. At the left is an image of an eagle, found at Hatra. The eagle was the symbol of the city of Hatra and numerous depictions of eagles have been found at Hatra. At the lower left is a Sumerian weight stone, commonly called a ‘duck weight’ because they were carved in different sizes and weights in the shape of a sleeping duck. Carved on the side of this weight stone are cuneiform characters; a dedication which commences: ‘For Nanna / his king / Shulgi / king of Ur / king of the four quarters (of the world) …’ To the right is the golden head of a bull, decorating the front of a lyre covered with inlays. Found in the Royal tombs at Ur, the lyre is Sumerian and dates to roughly 2,250 B.C. Figure 5 ¬– The back of the 5-dinar note; showing the house, or mudhif, of modern Iraq surrounded by ancient artefacts. One of the interesting aspects of these notes is the portrait of Saddam Hussein. The 50-dinar note of the first emergency issue copies this portrait and many notes of the later emergency issues also copied this portrait – right down to the stripes on the neck tie (see Figure 6). So, although the proof and specimen notes, prepared by De La Rue, are scarce and were never issued, they provide an interesting legacy of the First Iraq War and the period of sanctions by the United Nations. They also offer an insight to the ancient history of Iraq, an aspect which is not replicated on many of the banknotes issued in Iraq. Figure 6 – At left is the image of Saddam Hussein on the proof 10-dinar note and at right is the image of Saddam Hussein from the 250-dinar note dated 1995 (SCWPM No. 85). This image of the Iraqi president, prepared for the unissued notes, was used on most emergency issues of Iraq. The images of the De La Rue specimen notes are courtesy of The Banknote Book. Assistance with the Sumerian duck weights was provided by Jerald Starr. Identification of the eagle at Hatra was provided by Vesta Curtis. Hall, H. R. Babylonian and Assyrian Sculpture in the British Museum, Les Éditions G. Van Oest, Paris and Brussels, 1928. The two principal rivers in Iraq are the Tigris and Euphrates. Baghdad is located on the Tigris River and this is why it is speculated the river on the note is the Tigris. The waterway could be the Euphrates or another waterway in Iraq. The sculpture is now in the British Museum. There are many large statues of winged bulls and winged lions, which stood at entrances to palaces. The many statues have a range of differences and, although it cannot be easily determined, it is probable the statues depicted on the note are in the National Museum in Iraq. The bas-relief on which the drawing is based is in the British Museum. The horse blinker is now in the Metropolitan Museum of Art in New York. 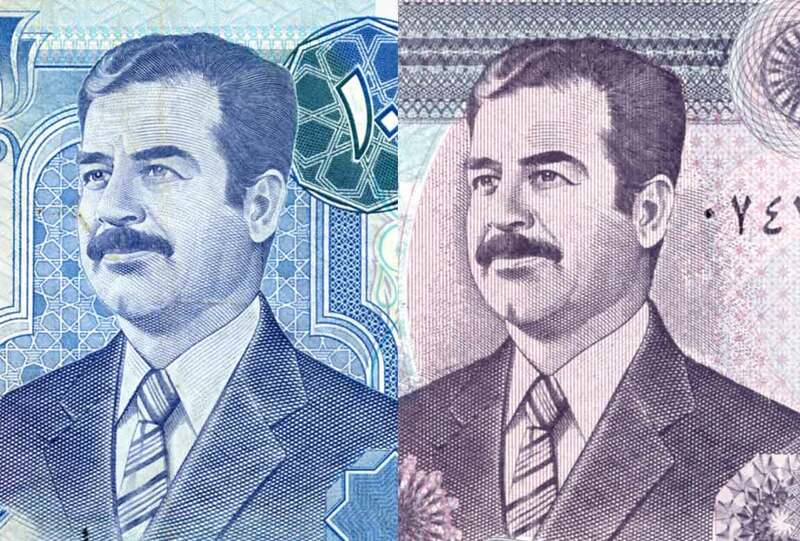 The portrait of Saddam Hussein is also used on the 500-dinar note prepared for this series. A more traditional view of Hatra appears on the front of the emergency 5-dinar note issued in Iraq and dated 1992–1412. The statuette of Ur-Nammu is now in the National Museum in Iraq.